For those of us that design solutions on Microsoft CRM this is where I think we need to spend the most thinking time as we study up on CRM 2013. In this post I’m going to walk you through the creation of a custom Business Process Flow and help explain how cross-entity flows work. 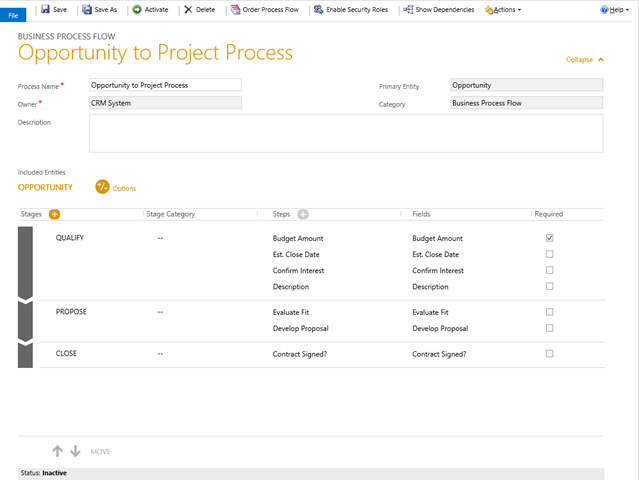 So, my plan then is to utilize CRM’s “Opportunity” entity and a custom “Project” entity. 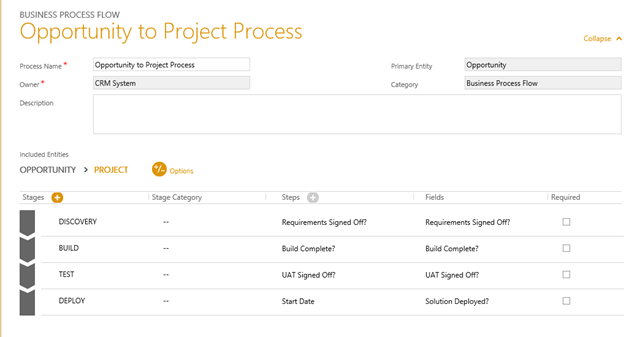 I will surface a process centric UI across these 2 entities using the Business Process Flow feature in Microsoft CRM 2013. 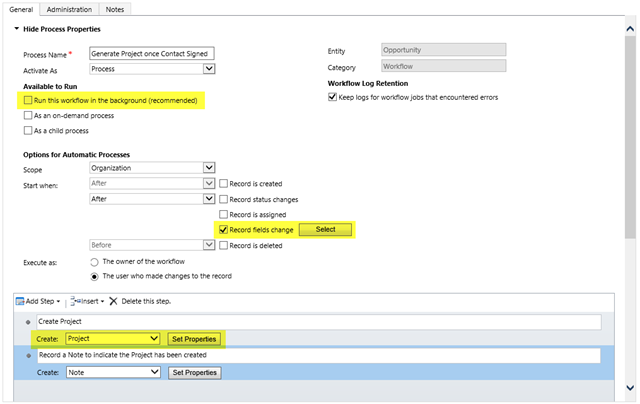 So the user experience doesn’t really dictate the need to automatically create the Project record, you just need to consider how you will default any values on the record if you don’t create it programmatically. The relationship field mappings will help you out a little there. I find the out-of-the-box experience of the Lead to Opportunity process a little disjointed in this area. 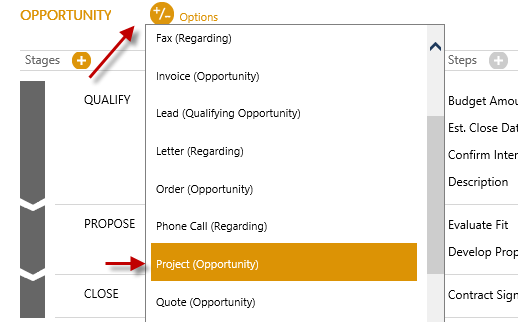 In order to progress the process you need to use the Command bar and Qualify the Lead. I don’t like that. In my solutions I will endeavor to keep the user in the Process chevron so they all they need to do is complete fields and click Next Stage. But all this does is allow you to define additional stages in your process where an earlier entity resume focus again (in my case this would be the Opportunity entity). If you do this, you cannot go any further with the process – i.e. you cannot add any additional entities, it is intended for the last steps in the process. 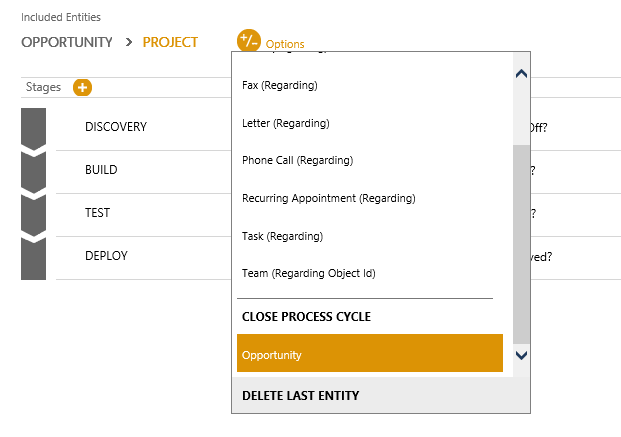 Returning to and updating the Opportunity doesn’t make sense in my scenario but imagine you want a process flow that starts with Case, jumps into Appointment and then returns to Case. That might make sense in a scenario where Cases are captured for on site service requests, a technician goes out and then the Case is closed out. 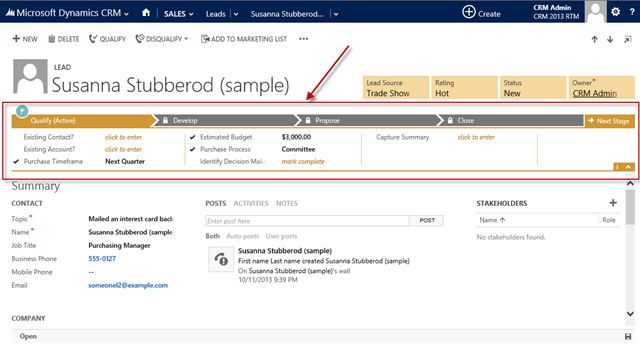 This entry was posted in Uncategorized and tagged Business Process Flow, CRM 2013 on October 16, 2013 by Gareth Tucker. Great post!…This will help developer to start designing Business Process Flow for sure. 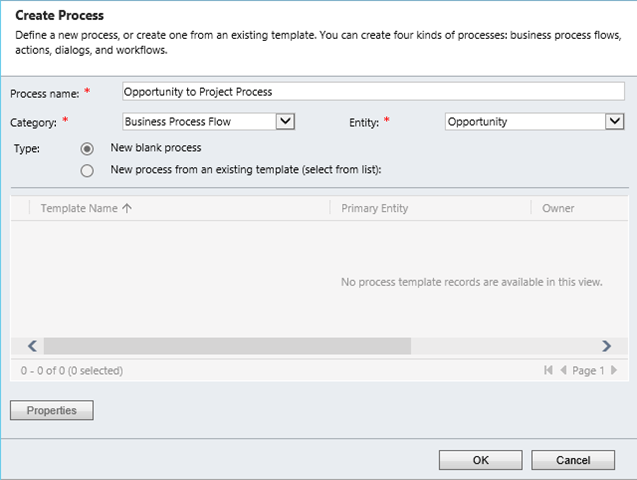 On Opportunity (in Polaris) a stage change did update a field on the opportunity form (salesstage) which meant it could trigger a workflow to change i.e. the probability depending on the actual stage. Also (as far as I remember) Polaris updated out-of-the box Sales Pipeline reports, which of cours is expected (but not the case in original 2011 release). 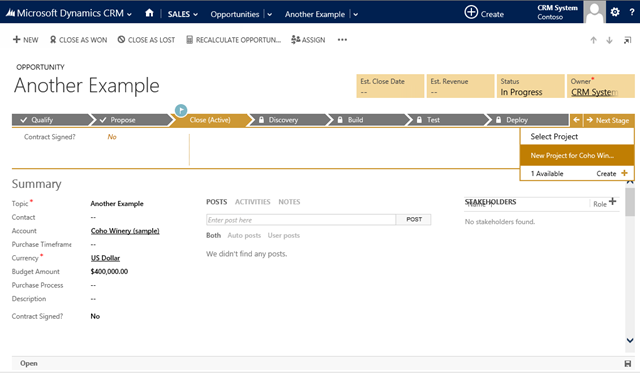 As I see the change, the sales process has been changed to a related entity with witch you can’t trigger any workflows. This means my old sales process workflows/solutions are not supported in the upgrade. Do you have any elaborations on how to make this possible in 2013? Please tell me how does the those lock symbols came in your process stages? In the process designer you can make Steps (fields) required. If the Stage contains required fields the next stage is locked until those fields are populated. Hey Thanks for the reply…but i wanted to ask in your screen shots there are some lock symbols on process flow stages for e.g. in your 2nd last screen shot there is lock symbol beside discovery stage…so i wanted to know that how those symbol appeared…i also wanted to do the same so please tell me bcoz i have already made the fields required but that lock symbol doesn’t appears . Great post. Can you please explain how to default values when we are not programmatically doing it? I want to make sure particular record is displayed when user clicks on Next Stage. When would a “Close as Won” occur on the opportunity in the above scenario? Would that be put as the “Close Process Cycle” step?